The All-in-One WP Migration plugin is required to be installed and activated to use the Multisite Extension. Once the download is complete, you will receive a message that will also give you the option to download your file locally. When the import process is successfully completed, you will be reminded to save your permalinks. 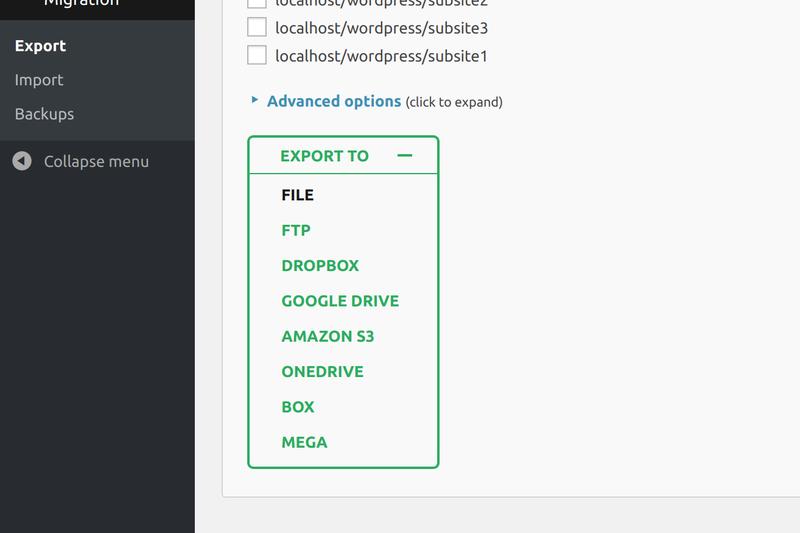 To export the entire network of subsites, choose the ‘network (all sites)’ option as shown in the screenshot. The archive then will contain the entire network, including all your subsites with all their data. You can then select where you choose to export the site to and start the export process. The import will overwrite the entire network with the imported file. 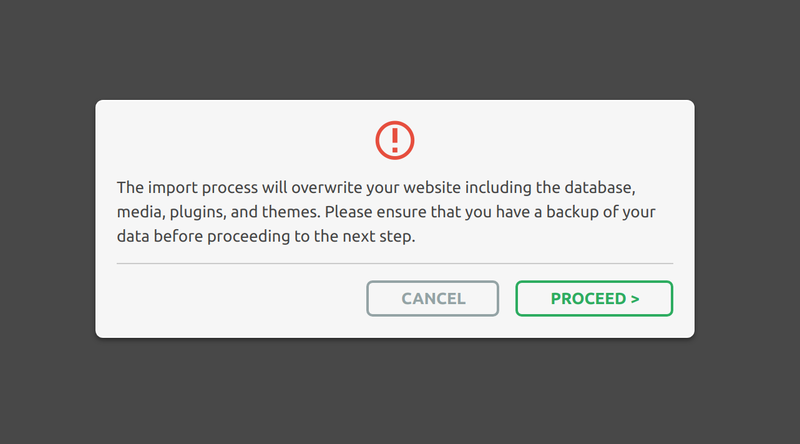 The process will overwrite your database, media, plugins and themes. It is recommended that you have a backup of your existing site before overwriting it. To confirm the import, press Proceed. This will start the import process and you will not be asked for any further confirmations. 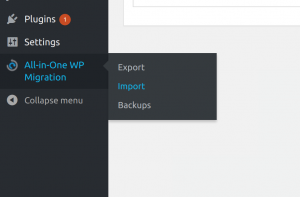 To export a single subsite from your WordPress multisite network, you need to select it in All-in-One WP Migration plugin export page. After that, proceed with the export in the usual way. The process will create an archive containing only the selected subset and its data. 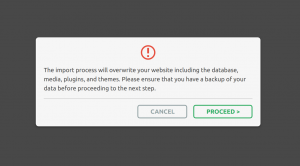 Existing subsite data on a subsite that you choose to overwrite will be replaced by the imported file, including the database, media, plugins and themes. This import will not impact the rest of your multisite network. It is recommended that you have a backup of your subsite before proceeding. Enter the name that your newly imported subsite will use into the URL. 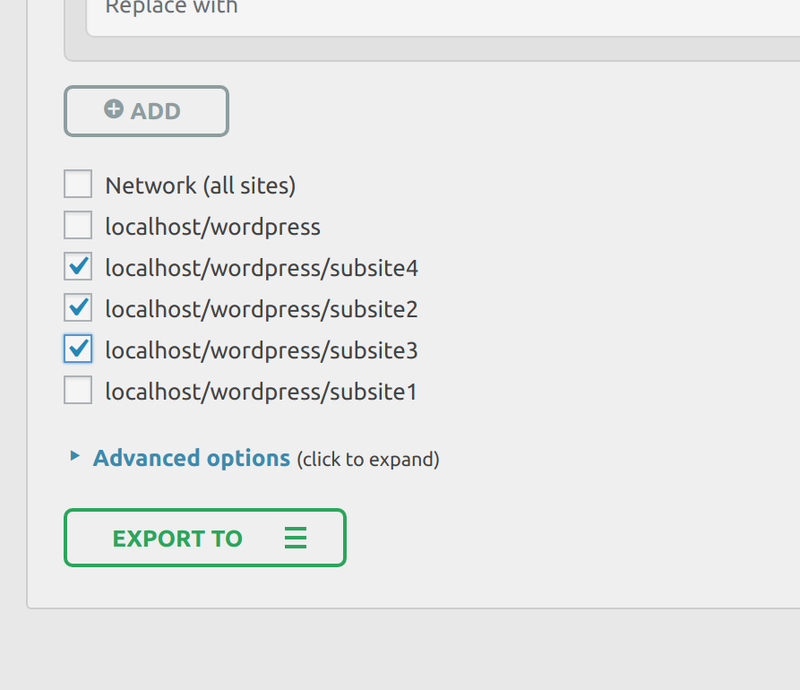 If you chose to import to a new subsite, one which previously didn’t exist in your multisite network, a subsite with the new name will be added to the network. Press Continue to start the import. The selected subsites will be added to the archive with all their data. The exported archive will only contain the subset data ( media, plugins, database and themes ) and not the data at the multisite network level. The imported subsites will replace databases, themes, plugins and media in the subsites they are imported into. The process will affect only the subsites selected, not the whole multisite network. 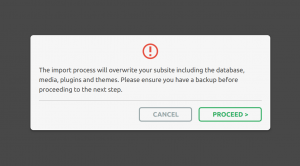 It is recommended that you have a backup of your currently existing subsites before importing new subsites. Once the URL for the last of the subsites is entered and the continue button is selected, the import will start. 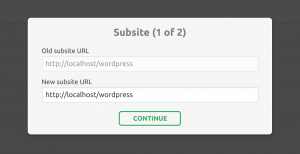 The exporting process of a single subsite from an existing WordPress multisite network is the same as the one described in part 3.1 of this tutorial. The export will create an archive containing only the selected subset and its data. 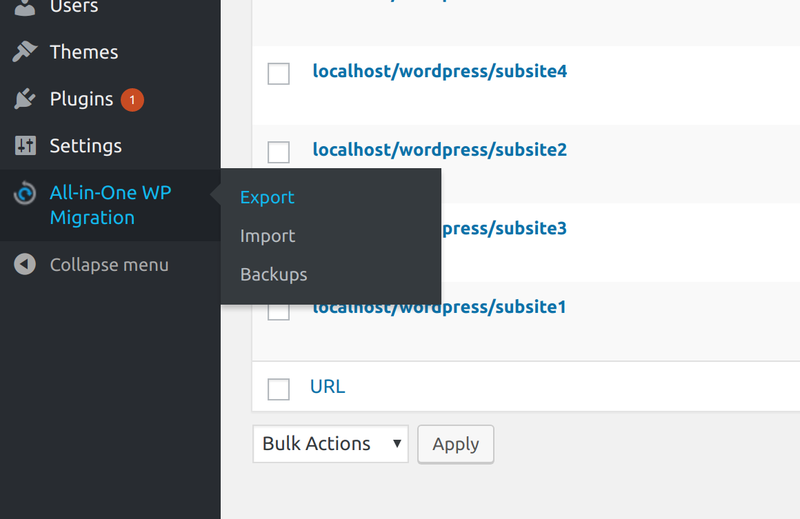 From the All-in-One WP Migration plugin Export page, select the subsite that you want to export and start the export. The process will create an archive containing only the selected subsite and its data. 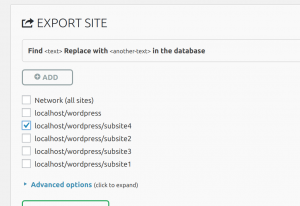 When you import a subsite to a standalone WordPress website, your website database, media, plugins and themes will be replaced by those of the imported subsite. It is recommended that you have a backup of your website before you start the import process. To confirm and proceed with the import press Proceed. The import process will replace your whole website with what was previously a subsite. The plugin starts the export and sends the archive to the chosen destination. Importing a standalone WordPress website into a network of sites does not affect the rest of the network, just the subsite that you overwrite, if any. To confirm the import, press Proceed. The standalone site import will replace database, media, themes and plugins only in the subsite it is imported into. The process does not affect the rest of the multisite network. 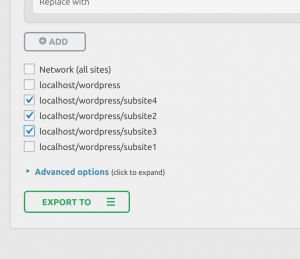 If you chose to import to a new subsite, one which previously didn’t exist in your multisite network, it will be created and added to the number of subsites in the network. For a new subsite, no data on your existing sites will be overwritten. 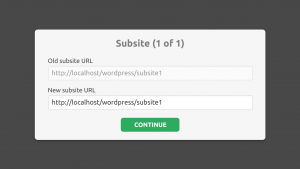 Subsite and Subdomain are two multisite specific terms. Subsite = mysite.com/site1; mysite.com/site2; mysite.com/site3. Subdomain = mysite.com; site2.mysite.com; site3.mysite.com. 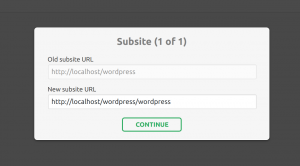 Does your plugin work with subdomains? 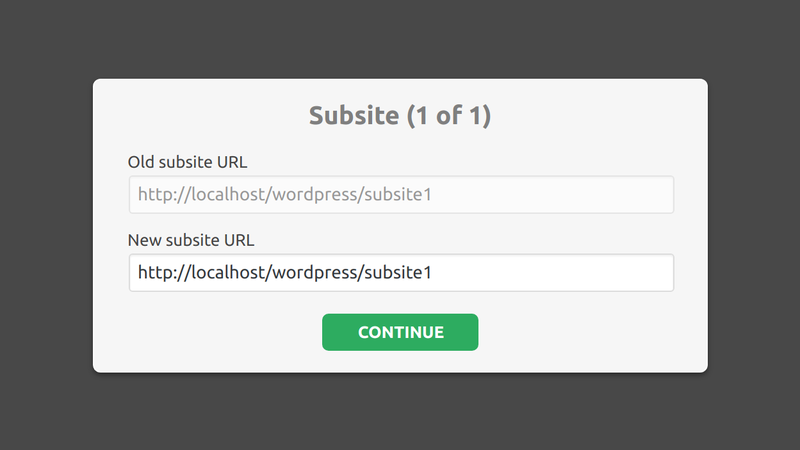 Yes, our plugin supports subdomains during export and import with multisite extension. After doing this I lost access to the network as the super admin doesn’t work anymore. 2. Import the other two and put them as subfolders. 3. Export the whole network. 4. Install on the production server. How can I avoid losing access to the super admin because on the original site there’s no super admin because it is a normal WordPress install. you will lose access to the super admin. Can you please tell if you are importing the first site from a standalone WordPress site or from a Multisite Network subsite? 1/ Export from standard WP site and import as multisite subsite? 2/ Export multisite subsite and import into standard (non multisite) WP site? 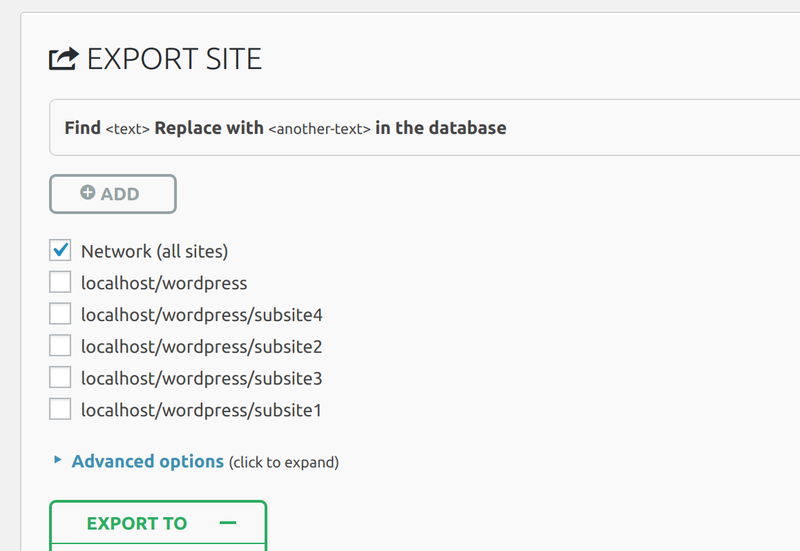 Yes, you can import a standalone WordPress site into a Multisite Network subsite – this is described in p.6 of the current User Guide. 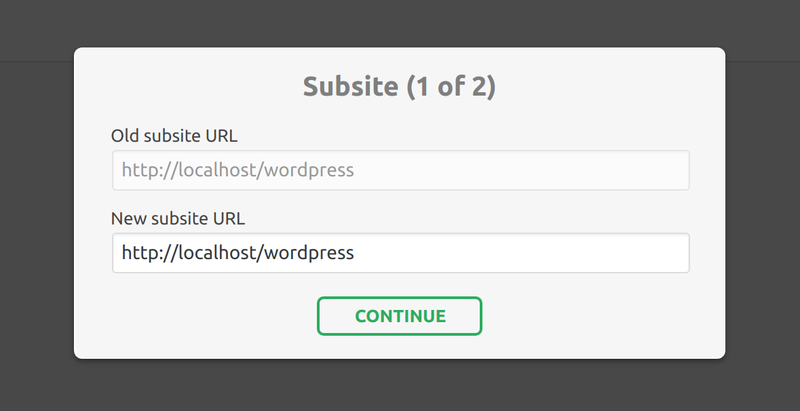 Yes, you can export a subsite from a Multisite Network and import it as a standalone. This is described in p. 5 of the current User Guide. Hello, is it possible to export the whole Multisite Network and import as a single/standalone WordPress site? To import on a standalone website, you will have to export one subsite from the Multisite network. Thanks, I did see that, but wanted to make sure nothing had changed in the current version. Wasnt there an option to export without users assigning existing posts to some standard user? No, there has not been such an option. Do you have a support document showing the recommended way to use Find & Replace? 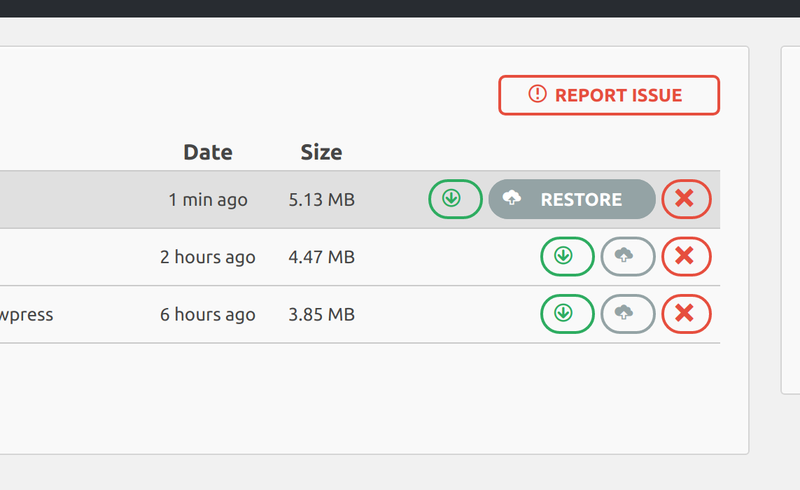 The find and replace is an advanced function that you don’t need to use in a normal backup migration. It will replace all iterations of the term in the find box with the term in the replace box. It should be used with caution. 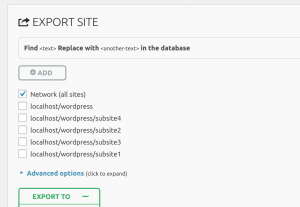 Is it possible to export and import on the same wordpress multisite cloning a site to a different domain. Eg. export domain1.com and import into domain2.com? 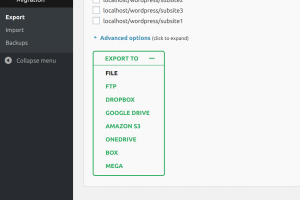 The plugin allows you to export a subsite of your choice and then import any backup of a subsite or standalone site in to your multisite network at the destination site of your choice. I have imported a standalone site into a multisite but it has changed to 2016 theme. I can make changes in Appearance > Customise and it says it’s saved but no changes are saved. Same in Settings – if I change settings (eg site name and strapline) I can’t save them. Can you email us at support at servmask dot com so that we can help to troubleshoot the issue? 1. 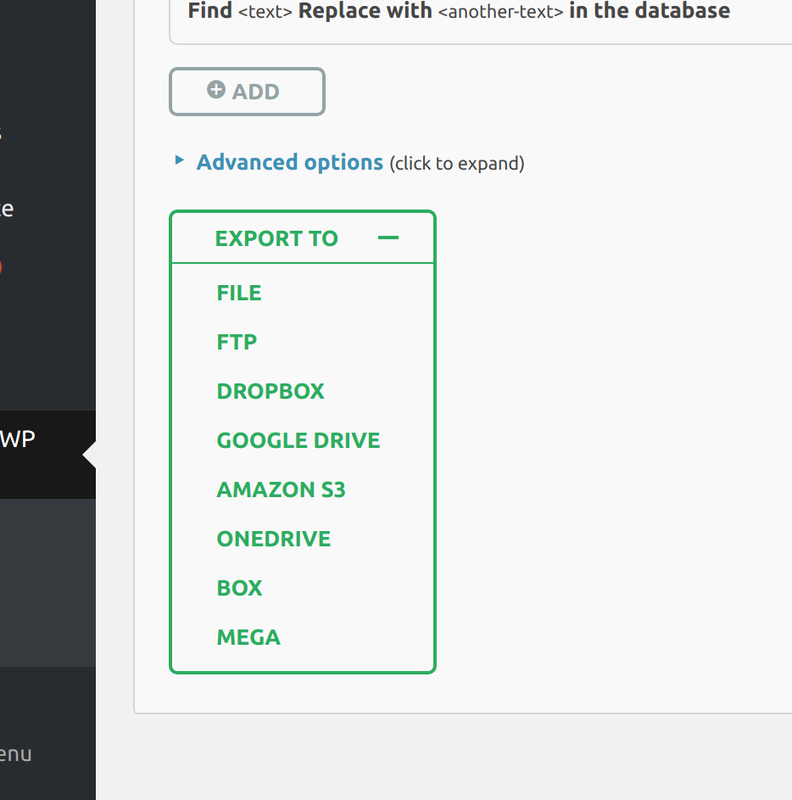 We don’t use default WordPress db table prefix (wp), but instead something else. Will that affect process of importing standalone WP as sub-site to multisite WP system? 2. Do you have a list of plugins which might affect or create problems in migration process? 3. Is it possible to set up scheduled backup process with cron job? 4. 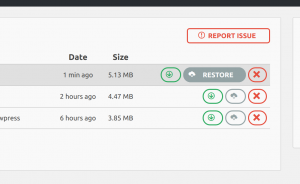 Is it possible to have local (on server) backup file your plugin creates be deleted automatically, after preset period of time (X hours, days)? That will not affect the process since the plugin detects the table prefix from wp-config.php file. We have our incompatible plugins listed here https://help.servmask.com/knowledgebase/incompatible-plugins/. If you have any of them installed, just make sure you deactivate it before export. 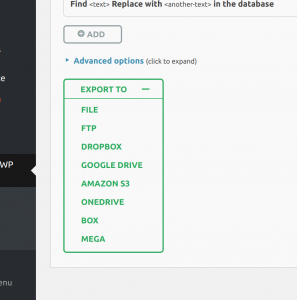 Our Dropbox Extension includes the auto-backup feature. Please check out https://help.servmask.com/section/dropbox-extension. The Retention Settings (on the Dropbox Settings page) can be configured to limit the numbers and the total size of the backups. We have WP multi site setup has sub domain and tables for sub domain in the same database. Above site does share same plugin and themes of wpms installation and same database. Now I want to export the above each site to standalone wordpress installation. Does your plugin work in this situation? I ask this question because of the screenshot you have posted only have sub site. I have a standalone site that needs to be migrated into a multisite. The site is fairly complex, it’s a virtual community of practice with over 300 users. We are using BuddyPress, BBpress, BuddyPress docs and several other plugins. Can your software handle a complex site? How are the users handled? All of our user’s profiles include xprofile types. Does the plugin retain author and editors posts or is a manual intervention necessary to associated users with posts and forum/topic replies? The multisite we’d be transferring this single site to is a brand new site. This site will be the only existing site transferred. The Multisite Extension will work for your use case without any issues. All the users you mentioned will also be migrated. Please write to us at support@servmask.com if you need any assistance. 1) with regards to standalone > multisite migration. What will happend with the plugins of the standalone site, if not part of the network? > we don’t want external plugins/themes to be added to our network..
2) on our multisite we have mapped domains. we want to use your plugin to create a staging, but wihout mapped domains. How to go about this? 1 – The active plugins will be imported and activated on the site. 2 – During import, the plugin will ask you about site name, you can leave it as is to use the auto-specified site URL, or choose your own. There is nothing additional or custom that needs to be done. Is there a way to export a single site without also exporting unassociated users? Currently there is no way but please feel free to request it here. Do the multisite extension ask me for the new domainname on import? Yes, you can perform a migration without Find/Replace. 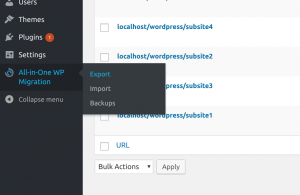 The plugin will automatically detect your site URLs on import. Is there a way to import the main domain wordpress site? The subdomains I understand, but the actual domain is important in our network. I’d like to use a subdomain as a staging site and then export that and import it onto the (non subdomain) main domain. 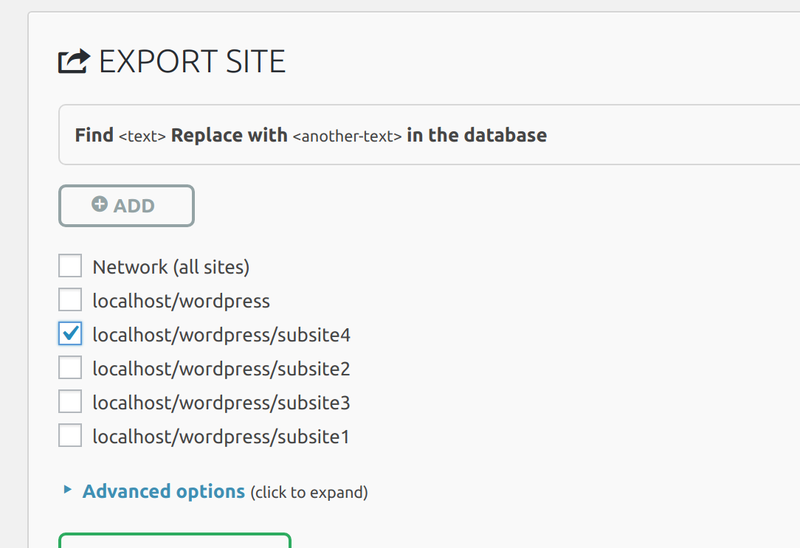 Yes, you can import into the main site in the Multisite network. During the import process, you will be allowed to select an existing subsite, main site or new subsite that you want to import into. You will have to select the main site to be imported to. I did not see that option when I attempted. You will first have to click on the “PROCEED” button and it will then give you that option. Hi, I bought a copy of multisite plugin for a project. Most of my projects are single sites. Can I use the multisite plugin for just single sites? Just don’t want having to purchase two different plugins. Yes, you can install Multisite Extension on your single sites to allow unlimited file size upload and enable the “Restore” functionality. Thanks for the quick reply, Pim. Good to know I can use the multisite version for single sites as well. This is of critical importance to my project – so I would like to confirm please that when exporting a multisite single blog to standalone installation, only those users associated to the single blog can be exported. Yes, your understanding is correct. Could the same purchased plugin be used on both the test site and the production site? Yes, you can use the same license on both the test and production site. Hi, I did review the comments so far but I want to make sure this will do exactly what I need before purchasing. I have a multisite set up with several unique domains (e.g. domain1.com, domain2,edu, etc.) I want to migrate these domains one at a time to a new multisite server because the old server is very outdated. Will this tool allow me to do that with only exporting an individual domain from one server, importing to the new server and then updating the DNS record w/o having to edit any of the exported info? Yes, Multisite Extension will work for your use case. Please feel free to contact us at support@servmask.com if you have any questions.